The App Store was built on the foundations of its predecessor, the iTunes Store, but some features of the latter didn't immediately appear in the former. On Monday, the App Store filled in another hole in functionality as Apple added the ability to gift apps. Previously, if you wanted to give the gift of iPhone applications, you had to buy an iTunes gift certificate, meaning that the receiver of your beneficence might very well go spend that money on any app—or, heaven forbid, music, movie, or TV show—of his or her desiring. But now, if it’s Math Flash Cards you want to give them, it is Math Flash Cards they will get. 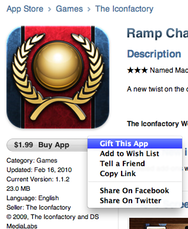 In order to gift an app, just click the triangle next to any app’s price and choose Gift This App (naturally, you can’t gift free apps). That’ll get you a form you can fill out with your name and e-mail, the recipient’s name and e-mail, and, if you'd like, a personal message. Heck, if you want, you can gift the same app to multiple people by entering several e-mail addresses; you’ll be billed the purchase cost of the app per address. You can either have the gifted app sent by e-mail or print out the gift yourself, for inclusion in a card or letter. Gifted apps show up in the iTunes Purchase History of the gifter, so if you need to refund them—for example, because you accidentally bought a camera app for your friend’s camera-less iPod touch—you would do so just as with any app you bought for yourself. I, for one, am glad that the App Store has finally added this long-awaited feature, because it means that this year’s holiday shopping has just gotten that much easier.